'Taxi': A Banned Filmmaker Works From The Road Iranian filmmaker Jafar Panahi has continued to make films since being officially barred from doing so. His latest finds him driving a cab, picking up passengers. 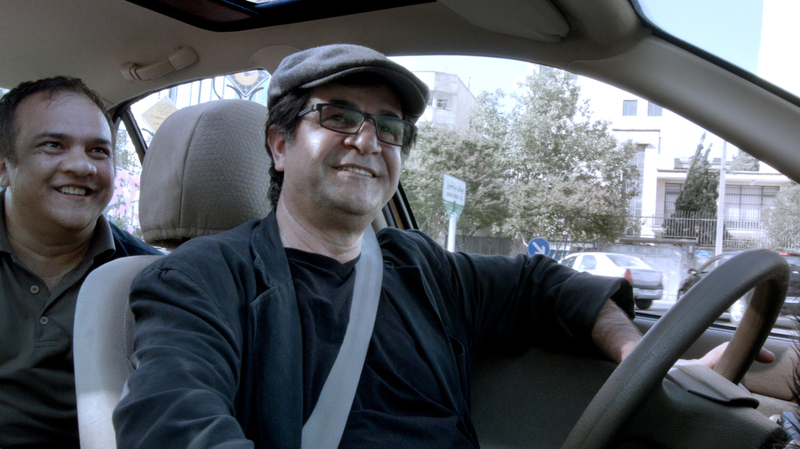 Director Jafar Panahi drives a yellow taxi cab through Tehran and interviews the diverse passengers he picks up in a single day. The world's most prolific banned filmmaker, Jafar Panahi has made three features since 2010, when the Iranian government officially prohibited him from working. The latest, Taxi, is the friskiest and most expansive. Its relative sweep, though, must be understood in terms of Iranian art cinema, which has always emphasized the things it can't show. After co-directing This Is Not a Film and Closed Curtain, which riffed on being under house arrest, Panahi takes to the street with Taxi, in which he tools around Tehran, picking up passengers. Two cameras are mounted on the dashboard, a setup that initially suggests we'll see random encounters. But it soon becomes clear that the passengers are playing roles scripted, or at least suggested, by the man who's driving the narrative. The movie is, in part, a playful tour of Panahi's previous work. One of the film's motifs is crime and punishment, recalling Crimson Gold. Two older women enter the cab with a cargo of ritual goldfish, much like the younger protagonist of The White Balloon. A human rights lawyer hops in, on her way to visit a woman who was arrested for attending a men's athletic event, as did the heroine of Offside. And Panahi gives a ride to a 10-year-old who is identified as his niece, Hana, and who resembles the willful little girls at the center of both The White Balloon and The Mirror. Clearly, Taxi was not designed for viewers unfamiliar with Panahi's films. It also includes a few references that may mystify non-Iranians who've seen all the director's movies. What's the significance of the women's urgent quest to release goldfish in a local spring before noon? It is, presumably, a tradition that Iranian viewers will recognize. The movie's other concerns are easier to understand, although of more interest to art-film devotees than action-flick fans. Panahi and mentor Abbas Kiarostami — who pioneered the car-bound tale with Ten and A Taste Of Cherry — have always been careful to stage their stories in public places, where the constraints on Iranian women are evident. Privacy and intimacy are avoided, since they can't be depicted authentically under Islamic censorship. Taxi visualizes such restrictions through the use of fixed-position cameras. Panahi sometimes leaves the cab, but the image doesn't follow him; viewers are left behind, stuck in the passenger seat. Hana reads the list of qualities, provided by her teacher, that make for an acceptable film, as her uncle grins. Among the requirements is to avoid portraying "sordid reality," Hana explains — shortly before pointing her camera out the widow and capturing a boy's small, but clearly sordid, act. Another of Taxi's passengers is a movie bootlegger who has all the latest American TV series and Asian art films. His vocation, he boasts, is "a cultural activity." One of the bootlegger's clients, a film student, enters the cab and asks which illicit DVDs he should buy. "I think all movies are worth watching," Panahi replies simply. What he doesn't add is that's because every movie is an insurrection, however small, against the authorities that would control what people are allowed to see.